Renowned Chef Alessandro Pavoni joins Stefano Manfredi in the Balla kitchen for a very special one off event and to celebrate the region of their birthplace, Lombardy . The Balla Manfredi Italian Regional Menu Series will commence on Tuesday 5th May as guest chef Alessandro Pavoni joins Stefano Manfredi in the Balla kitchen to celebrate the region of their birthplace, Lombardy. The wealthiest and most populous Italian region, Lombardy is agriculturally rich due to the influence of bordering Austrian mountains and the surrounding vast European plains. Dishes of Lombardy largely incorporate ingredients such as maize, rice, beef and pork. 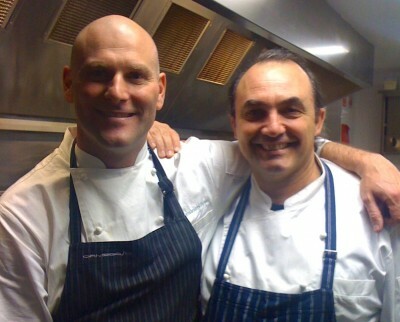 Pavoni and Manfredi , known fondly in Australia as I LOMBARDI , will be serving an entrée of Baccala of Glacier 51 Toothfish, Carnaroli Risotto with Wild Mushrooms and Chestnuts followed by Roasted Turkey with a Bread and Mustard Fruit.